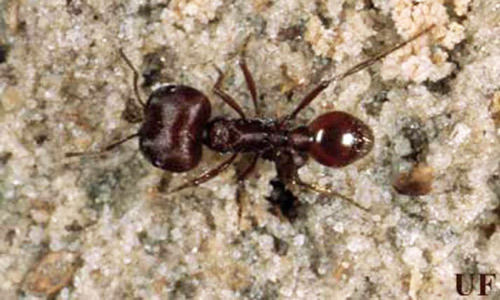 Although the Florida harvester ant, Pogonomyrmex badius (Latreille), occurs throughout most of Florida it is limited by its ecological requirements. Where it does occur, the ant nest is readily visible as a large cleared area with a number of slow moving individuals on the surface near the nest. Harvester ants in the genus Pogonomyrmex received this name due to their practice of gathering seeds for food. While there are 22 species of harvester ants found in the United States, only the Florida harvester ant occurs east of the Mississippi River (Smith and Whitman 1992). Figure 1. Major worker of the Florida harvester ant, Pogonomyrmex badius (Latreille). Photograph by Lyle J. Buss, University of Florida. 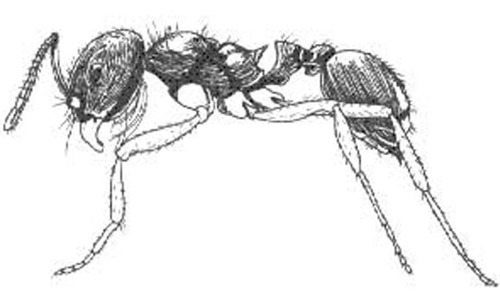 The Florida harvester ant is found from Florida to North Carolina (Haack and Granovsky 1990) and west into Mississippi (Creighton 1950) and Louisiana (Cole 1968). The ant is the only eastern representative of the genus Pogonomyrmex (Cole 1968). The adults are dark rust red in color (Haack and Granovsky 1990), with the worker caste strongly polymorphic (1/4 to 3/8 inch long) (Smith and Whitman 1992). The major worker has a disproportionally enlarged head (after Creighton 1950). Like most other Pogonomyrmex spp. the Florida harvester ant has a psammophore (rows of long hair on ventral side of head) but it is poorly developed (Smith and Whitman 1992). The antennae are clubless with twelve segments. The thoracic dorsum has the sutures obsolescent or absent, and the thorax is not impressed between the masonotum and epinotum; The abdominal pedicel consists of two segments. The tibial spurs on the middle and hind legs are very finely pectinate. Figure 2. Harvester ant worker, Pogonomyrmex badius (Latreille). Drawing by Division of Plant Industry. The Florida harvester ant differs from all other Pogonomyrmex spp. in having polymorphic (more than one size) workers. The huge headed soldiers (major workers) are not abundant in the colonies and seem to be no more aggressive or pugnacious than the intermediate and smaller workers (Wheeler 1910). 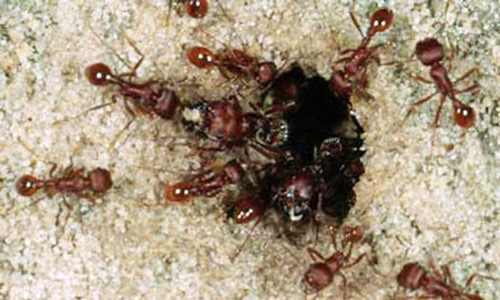 The Florida harvester ant nests exclusively or by preference in sand. It requires open areas in which to build its nest and tends to nest in open woodlands or grassy areas (Haack and Granovsky 1990). Xeric hammocks are preferred. Many nests are found on lawns, around gardens, and in fire lanes (Van Pelt 1958). The mound is very slight and flattened with single or multiple entrances in the center and is from 30 to 60 cm in diameter. Unlike most other harvester ant species (Haack and Granovsky 1990), Florida harvester ant workers make no effort to clear vegetation from around the mound (Wheeler 1910). However, the mound is often covered with small pebbles or charcoal from burned areas (Smith and Whitman 1992). Figure 3. Colony entrance of the Florida harvester ant, Pogonomyrmex badius (Latreille). Photograph by Lyle J. Buss, University of Florida. The ant is vigorously active in rather low relative humidity (below 55 percent) and in high temperatures (35-40°C). Mating swarms usually occur in the afternoon after a rain (Haack and Granovsky 1990). Winged forms (reproductive adults) have been observed in the nests in May, and mating flights were recorded for June (Van Pelt 1958). Haack and Granovsky (1990) state that harvester ants swarm from June to October although the swarms are more common during August and September. Colonies are long lived and one was observed to last at least 19 years (Haack and Granovsky 1990). There is a single queen in each colony (Smith and Whitman 1992). The ant harvests the seeds of many plants and stores them in the flat graneries of its nest which consists of many subterranean tunnels and chambers (Haack and Granovsky 1990, Tschinkel 2001). It not only collects seeds that have fallen to the ground, but also plucks them directly from the plants, husks them and deposits the chaff on the kitchen middens at the periphery of the mound. Seeds from the following plants have been identified from nests: ragweed, crab grass, small crab grass, rough buttonweed, sedge, Paspalium sp., poke weed, red clover, alfalfa, evening primrose, narrow leaf vetch and crotonweed. Figure 4. Foraging Florida harvester ants, Pogonomyrmex badius (Latreille). Photograph by Lyle J. Buss, University of Florida. The Florida harvester ant moves its nest periodically (an average of once every 234 days) in response to changes in microclimate resulting from shading due to overhanging vegetation. Pogonomyrmex workers of one colony will readily fight members of another colony of the same or different ant species and continued strife of this kind also results in colony movement (Smith and Whitman 1992). The Florida harvester ant is not of economic importance to growers and homeowners, is not aggressive and almost has to be forced to sting someone. However, the sting is among the more painful of those received from ants and the pain lasts longer than usual for ant stings due to the poison injected (Haack and Granovsky 1990). Some swelling may also occur as the reaction to their stings spread along the lymph channels (Ebeling 1978). A personal account of a sting episode by Wray (1938) is as follows: "Several ants stung me on the wrist, and after a few minutes an intense fiery pain began in this area which was about two inches in diameter. It turned deep red in color and immediately a watery, sticky secretion came out of the skin. This area became hot and feverish and the excruciating pain lasted all day and up into the night." At least one death, a child in Oklahoma, has been credited to stings by the red harvester ant, P. barbatus (Haack and Granovsky 1990). 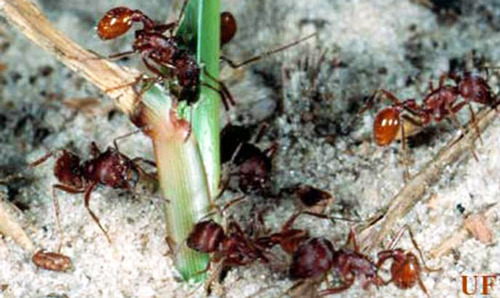 Generally, management of the Florida harvester ant isn't necessary unless the ant is located where small children may be playing or in other similar circumstances. An adult may easily avoid the ant, thus avoiding the extremely painful sting. The Florida harvester ant uses odor trials as well as sun orientation to return to food sources (Ebeling 1978) so placing baits on these trails may help control a colony. Mounds should be treated during the hottest part of the day, as the ants are least active at this time, by injecting a labeled insecticidal dust into the entrance (Smith and Whitman 1992). Insect growth regulators are also recommended, but take longer to destroy the colony. Cole AC Jr. 1968. Pogonomyrmex harvester ants. University of Tennessee Press. Knoxville, Tenn. 222 p.
Creighton WS. 1950. The Ants of North America. Bulletin of the Museum of Comparative. Zoology 104. 585 p.
Ebeling W. (1978). Urban Entomology. Agricultural Sciences Publications, University of California, Berkeley, CA. Haack KD, Granovsky TA. (1990). Ants. In Handbook of Pest Control. Story K, Moreland D (eds.). Franzak & Foster Co., Cleveland, OH. pp. 415-479. Smith EH, Whitman RC. 1992. Field Guide to Structural Pests. National Pest Management Association, Dunn Loring, VA.
Tschinkel WR. (1998) Sociometry and sociogenesis of colonies of the harvester ant, Pogonomyrmex badius: worker characteristics in relation to colony size and season. Insectes Sociaux. http://link.springer-ny.com/link/service/journals/00040/bibs/8045004/80450385.htm (17 June 2003). Tschinkel WR. (2001). Colonies in space. Natural History Magazine. http://www.amnh.org/naturalhistory/0401/0401_feature.html (17 June 2003). Van Pelt AF Jr. 1958. The Ecology of the ants of the Welaka Reserve, Florida (Hymenoptera: Formicidae). Part II. Annotated List. American Midland Naturalist 59: 1-57. Wheeler WM. 1910. Ants, their structure, development and behavior. Columbia University Press. New York and London. 663 p.
Wray DL. Notes on the Southern harvester ant (Pogonomyrmex badius Latr.) in North Carolina. Annals of the Entomological Society of America 31: 196-201. Originally published as DPI Entomology Circular 297. Updated for this publication. Publication Date: June 2003. Last revision: January 2013. Reviewed: December 2017.